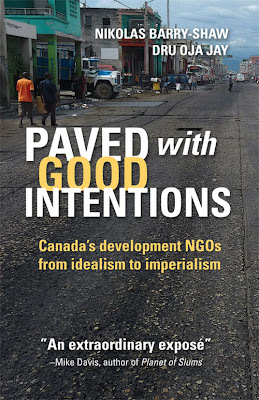 Strange how reality works in mysterious ways sometimes: While I had started feeling guilty that I had not started to read and review Nikolas Barry-Shaw and Dru Oja Jay’s book Paved with Good Intentions – Canada’s development NGOs from idealism to imperialism, the current discussions around a potential dissolution of CIDA give the book an even more contemporary relevance as it gets ready for the second printing.The book tells and important – and certainly not just limited to Canada! – story about the changing relationships between the state, civil society, NGOs and, depending on your political viewpoint, the professionalization/depoliticization/selling out of this growing sector of the global aid industry. Although there are some great reads on technology, learning and social change featured in this week's review (including a great ethnographic piece on 'performing success' in the context of OLPC) you should definitely check out very interesting reads on new research that suggests that corporations from the unhealthy commodities industry should have no place in policy-making,'feel-good activism' and the moral complexities between 'inquiry and insult' when participating in an exercise such as the 'Two Dollar Per Day Challenge' (i.e. pretending to be poor when you really aren't...). If you are still curious, do check out a good Bono-bashing piece and the inaugural open access issue of the new Peacebuilding journal!